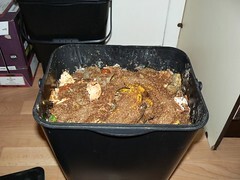 I make compost and am fascinated with the various methods of creating it. My reasons for making compost are partly because it truly is black gold when it comes to the garden and partly because it's a grand way of recycling cardboard, shredded paper and all sorts of kitchen waste that would otherwise be thrown in your bin where it would rot and smell until it got carted off to land fill where it would then rot and smell some more, producing greenhouse gases and filling up the rapidly depleting space for all the rubbish that can't be recycled (and the sooner land fill area runs out then the sooner a new incinerator comes to your neighbourhood and none of us want that to happen). And probably a large factor in why I compost is because I am a tight Northern short arse who hates spending money when he doesn't need to! 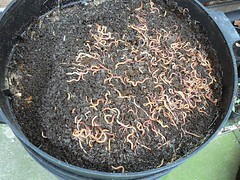 I use a Can-o-worms wormery, bought from Wiggly Wigglers in 1998. The joy of this is you start with just one layer and once full add the second and then the third and so on. Once you have run out of layers the bottom is generally ready i.e. all your kitchen scraps, weeds, cuttings, toilet rolls and shredded bank statements/bills have been eaten by the worms and turned into vermicompost, an amazingly high nutrient compost (so high in nutrients that it needs mixing with other compost before being used for house plants etc, though it can be chucked on your borders as the best soil improver you will ever come across). So to empty the bottom layer you take off the top ones, remove and empty the bottom one and that now becomes your empty top one. That way the worms are never disturbed (or at least not too much), and you can get straight to the good stuff without getting overly messy. I have a three compost bin system i.e. 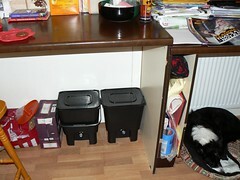 three of the dalek type plastic bins which are rotated. 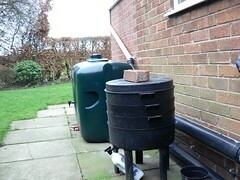 I have one bin with almost ready compost (the nearest, on the right of the photo), emptied twice a year. Once emptied I empty the second bin and fork everything into the newly empty bin. Then I empty the bin with the newest stuff in it (furthest away in the photo) - this is usually quite smelly as new stuff is still being added to it. The contents of this now goes in my middle bin leaving that third bin empty ready for me to start adding new stuff. Notice there's a fair bit of cardboard in front of these bins. This is a) so I can get to them without getting too muddy and b) so I can add it to the working bin as a layer of carbon between grass cutting and kitchen scraps etc. The act of turning the compost (by moving it from one bin to another) aerates it and kick starts the composting process thereby speeding the job up. Because of the amount of kitchen waste and Bokashi added these three bins attract a lot of worms and I basically have three massive worm bins on my hands. This speeds up the process even more and compost is ready within about 6 months - I empty a bin twice a year and it's generally good quality stuff. I'm hoping to start a new vegetable patch this year (see this recent post for details) and intend to start a more traditional compost heap/pile where I will be making use of plenty of fresh horse manure and straw to get it nice and hot. This will be the more traditional form of composting and will get so hot that the worms will keep well away for a few months - they will start their work once it has started to cool down in the centre. I also have a Bokashi system (again bought from Wiggly Wigglers) as it is a real fast way of composting and is used when the worm bin can take no more. Generally I make sure there's only a couple of inches of uneaten food in the top layer of the wormery otherwise it starts to putrefy - a wormery working well smells only of freshly dug earth rather than rotting food. 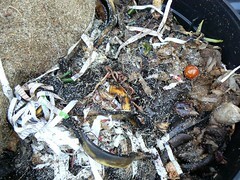 Bokashi can also take cooked foods such as meat and food scrapings - all the stuff they advise against in a wormery or compost heap for fear of attracting vermin. The food is added to the Bokashi bin in layers, pressed down to get rid of air pockets and then sprinkled with bran that has been treated with EM (Effective Micro organisms). The lid is then tightly put back until the next batch of tea bags, coffee grounds, vegetable peelings and left over food stuffs is ready to be added. Once full the bin is left sealed for about a fortnight and the contents, once ready, look like they have been pickled. However, bury it in your borders and it will have rotted down within a few weeks. 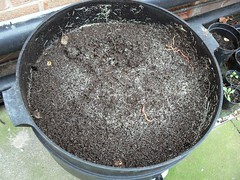 I often add it to my wormery as it speeds up the worms and gets them munching quicker, turning it into more usable compost quicker. It also speeds up the compost bins as well. But mainly, it is in your kitchen so it saves you traipsing around on a cold winters night in the rain going to the wormery or compost bins! You want to have a go at my new wonder fuel for cars. You have no idea how useful this was, cheers bud. This is EXACTLY what I have been looking for mate,cheers! You can purchase Compost Bin HQ storage or bins from the market that help you store your compost without having to worry about the bacteria and the smell it produces. 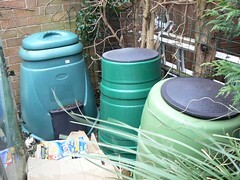 These bins can help in the decomposition of the compost you are making and prevent rats from getting to your compost.